AWOL relies on fundraising to raise enough money to care for the animals in Luxor. 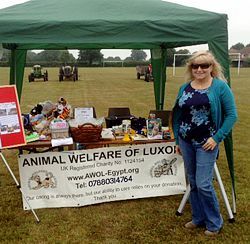 Without fundraising events AWOL would be of little help to the animals and their owners. AWOL trustees are always happy to hear from supporters who would like to help out with fundraising. If you would like to hold a fundraising event please let us know and we will try to give you as much help as you need. We can publicise your event on the AWOL website, Facebook and in the monthly newsletter. Suporters have, in the past, raised funds from such diverse events as tack sales, scarecrow competitions, market stalls, pamper nights, coffee mornings, plant sales, sponsored walks and numerous other different types of event. Fundraising can be great fun, especially if you get a group of friends together to organise something!